It came to light yesterday, when you were describing the "Core Olympics" in which your class was participating on the last day of school before Christmas break. "I really want to be in the frozen t-shirt contest, where you take a frozen t-shirt and defrost it enough to put it on. The first one on wins." A frat challenge for 11 years olds if I've ever heard of one. Backing up in time to four months ago: It's the middle of August, and you've been at Camp Billings for two weeks. When Dad, Max, and I arrive to take you home, Mia greets us first. "Will has been wearing the same sock for a week." Notice she said "sock" not "socks". Sure enough, when I find you at the tether ball with Baxter, you're wearing one knee-high rainbow-striped toe sock on one foot, a black strip of fabric tied around your other ankle, and your red Crocs. "Are other people dressed like that too?" I asked. They were not. Another 11yo frat boy sight to behold. One of the things I LOVE about you is that your sense of self and independence is already strong and bold. You've got your own style, you make your own choices, and you don't really seem to give a flip about what others think. That's not to say you're not conscientious. Your trendy Justin Bieber hair swoosh and your skinny jeans give that away. In this, your sixth-grade year, you are holding strong academically and surprising me with a solid performance in language arts--a subject that didn't spark your interest in any way whatsoever in previous years. I also see you highly enjoying your first year studying French. You took up cross-country running, basketball, snowboarding, and swimming this year--leaving taekwondo behind. 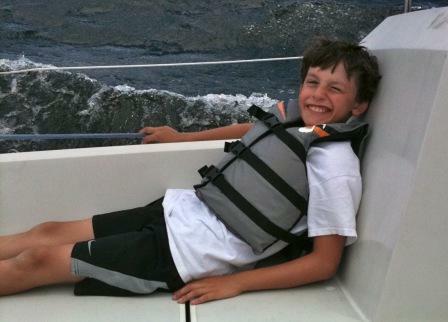 You also loved spending days on the lake with Dad on the sailboat or on a board behind the ski boat. When I watch you groove on piano and your toe taps, mine does too. You are still an amazing older brother to Max. The other day, he was struggling with something--I don't remember what--and you doubled back to kindly help him. Neither Max nor I asked you to help, but you just did it as naturally as any warmhearted person would. Finally, about a month ago, I said something to you, and you scowled at me. Then you followed with a big grin, as if you say, "I was just kiddin' mom." And I thought to myself...I don't have much longer before that scowl is NOT followed by that wonderful grin. I dunno though...I have a feeling that grin is here to stay and will get you far--with both your mom and the rest of the world. You write the best tributes to your kids.